The Wisconsin State Fair is at its full, Ferris wheel peak. The rides are whirring, and every deep fryer and strip of bacon north of Chicago has been commissioned to feed the hungry crowds. While the animals are cute and the rides are fun, FOOD is the most anticipated event. 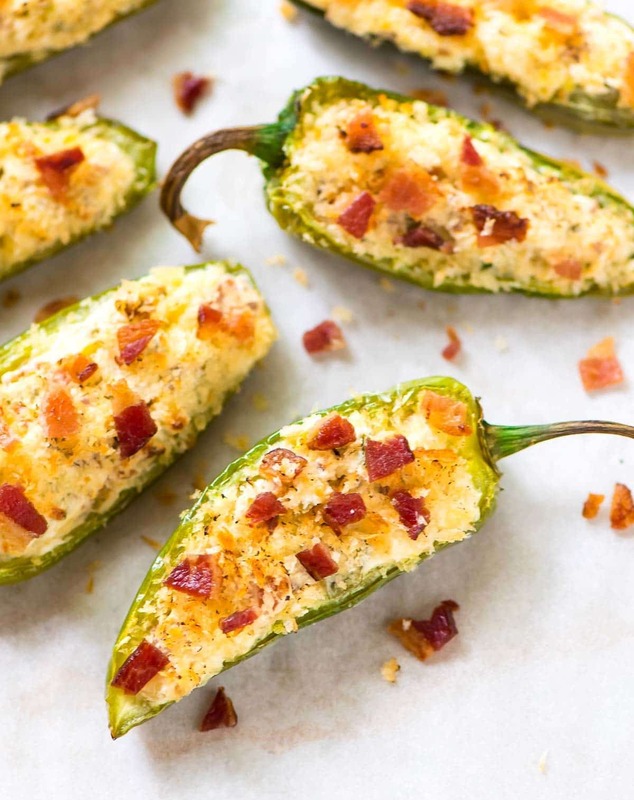 Today’s recipe for cream cheese-stuffed Bacon Jalapeño Poppers is inspired by the State Fair, but you don’t need to travel any farther than your kitchen to enjoy them. Halved jalapeños stuffed with a decadent cream cheese, shredded cheese, and bacon filling, then sprinkled with Panko breadcrumbs and baked to golden, crispy perfection, these Bacon Jalapeño Poppers should come with a warning label: ADDICTION INEVITABLE. Take your first cheesy, creamy, and crunchy bite, and see if you don’t agree. I’m teaming up with my local grocery store, Pick ‘n Save, to share this recipe, and I’m excited for you to try it too! Bacon Jalapeno Poppers—Baked Not Fried! Like most state fair foods, classic stuffed jalapeño poppers are deep fried, but for the ease of at-home preparation (and to save room for my other state fair guilty pleasures—ahem, deep-fried Snickers bars), I decided to try baking the bacon stuffed jalapeños instead. The results were blue-ribbon worthy! Not only are these Bacon Jalapeño Poppers just as addictive as the original recipe that inspired them, they are incredibly simple to prepare. Beat the cream cheese filling, half and stuff the jalapeños, then bake. No messy fryer or oily clean up required. Ben has already requested these Bacon Jalapeño Poppers for every football game watch from season kick off through the Super Bowl, so I’m definitely glad they are a) easy, b) baked (my jeans agree), and c) EASY. You can even stuff the jalapeños a day in advance, then bake them just before serving. Watch out funnel cakes: these Bacon Jalapeño Poppers are about to become the new fair favorite! 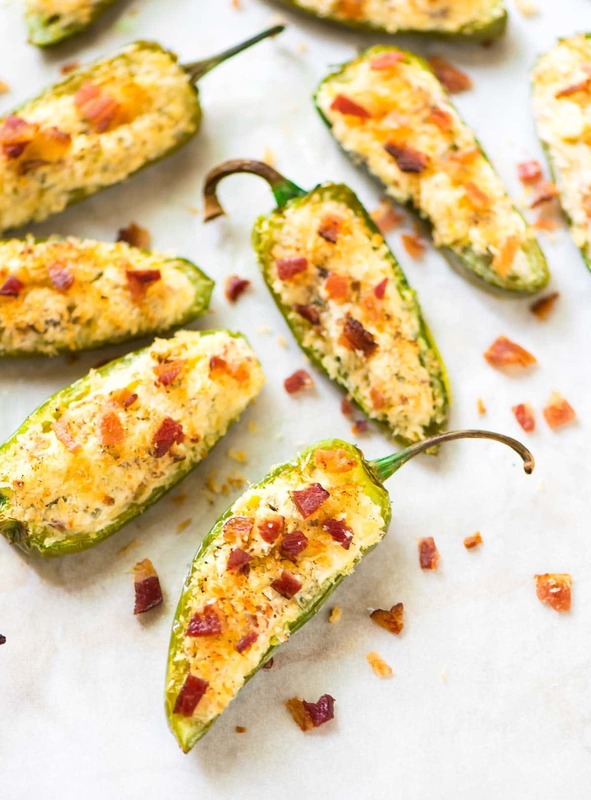 If you like spicy, you will LOVE baked Bacon Jalapeno Poppers! Halved jalapeños stuffed with cream cheese, bacon and garlic, topped with crispy breadcrumbs. If necessary, cook the bacon according to these easy steps. Once cool, dice the bacon into small pieces. Preheat the oven to 350 degrees F. Lightly coat a baking sheet with nonstick spray or line with parchment paper or a silpat mat. Set aside. In a medium bowl, beat together the cream cheese, grated cheese, three-quarters of the bacon, green onion, garlic powder, and salt. Spoon the filling into each jalapeño cavity. Arrange the peppers on prepared baking sheet, filling-side up. Sprinkle a small amount of panko on top of each jalapeno, then lightly coat the top of the jalapenos with nonstick spray. Bake until the jalapenos are tender and the breadcrumbs are golden, about 15 to 18 minutes. If the panko isn't browned to your liking when the peppers are soft, switch the oven to broil and broil for 1 minute or so watching VERY CAREFULLY to make sure the breadcrumbs do not burn (don't walk away!). Remove from oven and sprinkle with remaining bacon. Serve hot. 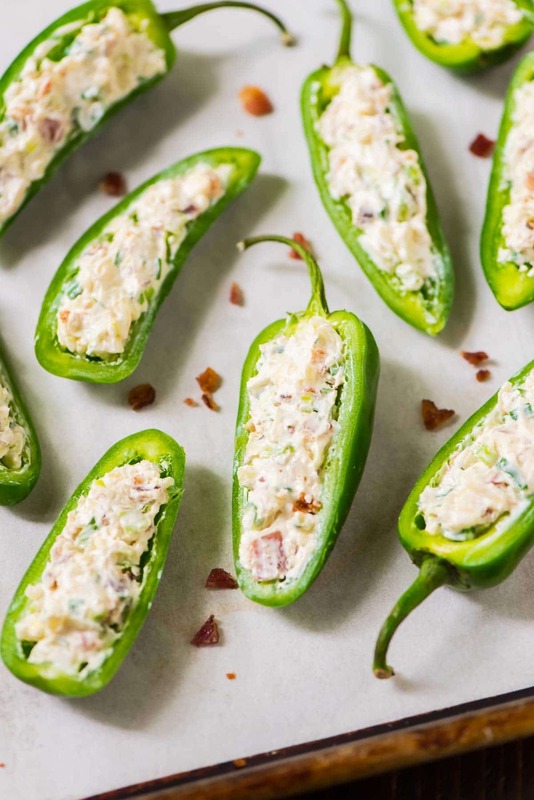 The Bacon Jalapeno Poppers can be prepared through Step 3 up to 1 day in advance. Sprinkle with panko and bake just before serving. I’m sharing this post in partnership with Pick ‘N Save. As always, all opinions are my own and thank you for supporting the brands and companies that make it possible for me to provide high quality content to you! Love the video! these look fantastic! Janine, I’ve never tried freezing, but I wouldn’t recommend it—I’m afraid it would negatively impact the texture of the peppers and cream cheese. You can prep them a day ahead though! 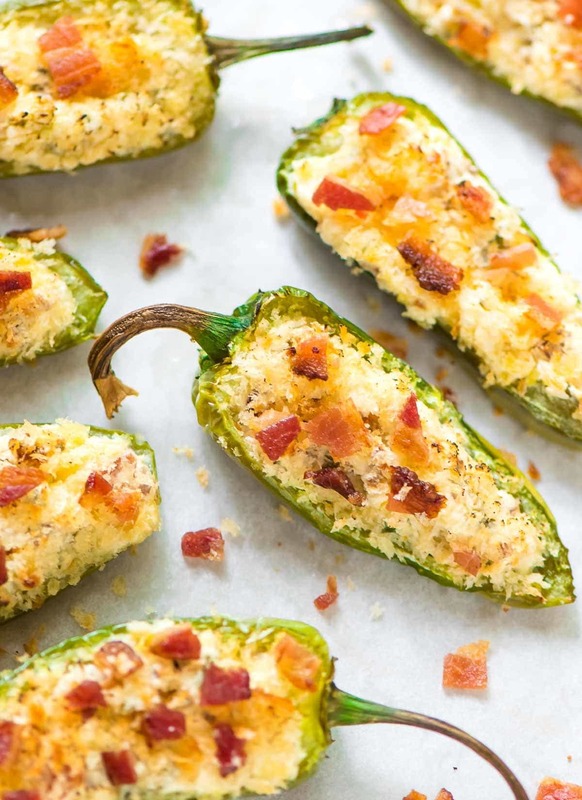 These jalapeno poppers are next level- game food, right here! 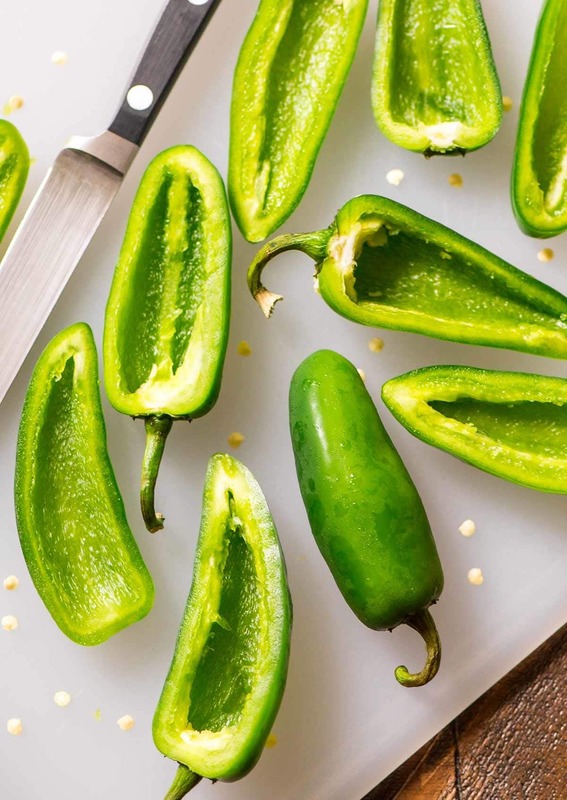 We are kind of addicted to jalapeño poppers, so I can’t wait to give your recipe a try! Erin, these look fantastic. Can’t wait to try at my next dinner party! This recipe is awesome and works terrific on the grill! YAY!!! I’m so glad to hear that Ann. Thank you! We absolutely LOVED this recipe. The flavor of the pepper came through and wasn’t overpowered by bacon and, more importantly, grease. YUM! I’m so glad to hear you enjoyed the recipe, Wendy! Thank you so much for taking the time to leave this wonderful comment. Jalapeño poppers with bacon? I had just googled it to see if I should bake them or broil them and found this recipe. I love it because you don’t wrap bacon around it. I had bacon left over from breakfast, which was a first by the way, and I was wondering if to save it for a club sandwich but hey, I just diced them up and added it to the mix and oh wow! Very delicious! The whole family loved them! I’m so so pleased to hear it Melissa! Thanks so much for sharing your feedback!